Aquarium of the Pacific | Shark Lagoon | Pacific Pals Live! Home > Exhibits > Shark Lagoon > Pacific Pals Live! 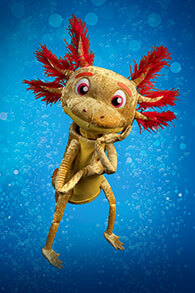 Explore and discover with the PACIFIC PALS in an interactive LIVE puppet show! PACIFIC PALS LIVE features science, music and comedy antics that are bound to leave you smiling ear to ear. Dive in to this entertaining world of talking animals with Captain Quinn, Seymour Shark and the adorable Piper Seahorse. These lovable explorers light up the stage in a 20-minute, fast paced, exploration extravaganza! 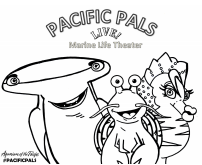 Join the PACIFIC PALS during Explorer Time, outdoors at the Marine Life Theater. Saturdays & Sundays: 11:30 a.m., 1:30 p.m., 3:00 p.m.
Captain Quinn grew up on the shoulder of a great sea captain. His favorite hobbies include scuttling across the ocean floor and discovering new sights and treasures. Quinn may appear gruff, but he has led his crew on many beach cleanups, keeping the sea clear for exploration, discovery and treasure hunting. At night, if you listen carefully, you can hear Quinn’s rough and tough crew, The Crabapples, singing shanties down the beach as they tidy it up. 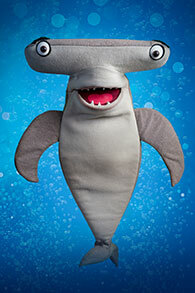 Seymour Shark is one fun-loving shark. One of Seymour‘s favorite things to do is to discover new ways to improve ocean living for his friends, family and future generations of sharks. He is always searching for scraps he can recycle to create home-made inventions. He placed 1st in the Tropical Pacific Middle School science fair three years in a row! Last year, Seymour took home the prize for creating The Blue Cavern Gardening Buddy, a self-operating kelp trimmer that generates its power from the ocean’s currents. Piper likes to think like a scientist. Being a seahorse, she doesn’t travel much, but she finds plenty to discover in the sea grass of her own back yard. Piper is known for her beauty, talent, but also her brilliance. She was the first seahorse to publish a book! “I Don’t Sea It That Way” is a best-selling, myth-busting textbook about mysteries in the deep ocean. She enjoys reading and learning about all living things, especially about her favorite subject, biology. What some explorers find slimy or gross, Piper finds fascinating and full of wonder. She jumps at any opportunity to learn more about ocean wildlife and how to protect it. Axl was born in Lake Xochimilco, a tiny lake in the Valley of Mexico. One day, Axl discovered that axolotls like himself couldn’t live in the lake anymore because of poor habitat health. Axl promised himself that he would become the first spokes-salamander for all animals who want to live in a healthy habitat. So, Axl left his home to spread the message of habitat protection with his greatest gift, song! Axl promised himself that he’d always use his music to inspire everyone to take better care of the planet we all share! 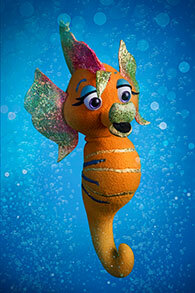 Sarah Seastar is a brave explorer who loves to discover new wildlife and new environments. She can be found anywhere adventure is to be had. 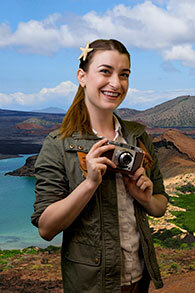 One day she was researching in the Galapagos Islands when she discovered a mysterious camera unlike anything she’d ever seen before. She quickly learned that by saying the words “I WANT TO DISCOVER” she could talk to animals! Now she accompanies the PACIFIC PALS on all of their expeditions, learning and sharing all she knows about how humans and animals impact and help each other. Take the adventure home with you! Enjoy discovering and creating with downloadable Pacific Pals activity sheets.